This paper explores the consequences on the so-called ‘democratic deficit’ of the recent developments within the Eurozone. It argues that the April 2011 Europlus agreement – which consolidates surveillance mechanisms on fiscal and economic policies of member states – together with the wider practices adopted to deal with ‘fiscal irresponsibility’ (neglecting both the asymmetry of the lender-borrower relation and the origin of the fiscal imbalances) represent a further step in the entrenchment of a technocratic neoliberal policy paradigm that is institutionally founded upon what Stephen Gill calls the process of ‘new constitutionalism’. 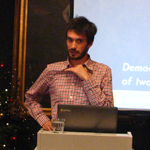 The latter concept expresses the tendency to devolve crucial aspects of socio-economic policy to independent or quasi-independent bodies largely secluded from democratic (popular) accountability, a trend that has been operative since the 1980s and has been at the core of the Maastricht treaty and Economic and Monetary Union (EMU). This disenfranchising of the European electorates is at the root of the declining participation rates in both national and European elections, in which the ‘economy’ has been largely depoliticised and bracketed off, signaling the turn to what Slavoj Zizek calls ‘post-political administration’. The irony is that the medicine might in the end kill the patient: the austerity policies implemented to ‘save the Euro’ might largely contribute to its demise. European Parliamentary Elections: Candidates as Possible Politicisers?